So here I am, in the third trimester of pregnancy, due in early May. I hope this review resonates with more people than it might have had I been a mother earlier. I am 37, almost 38 years old and my birthday is the day after the due date, although I know that due dates are often largely missed. It has been quite a journey to get here already. I have watched most of my peer group have two, three or more children over the years, or else decide that having children wasn’t for them. I have watched my friends go through the ups and downs and life-changes and it has helped to emphasise for me that life is what you make it, whether you have children or not. Through the patient guidance of several teachers, culminating in teaching from Sarah and support from my teaching colleague Kathryn, I have taught my beginner students for several years and gained a great deal from being able to share Astanga yoga in a nurturing sense – something I hope to continue again soon. And like many of you, I have wondered and worried about the “loss of my existing practice” should my body change through pregnancy and beyond. I am a vata body type in the Ayurvedic sense, with highs and lows of energy but also a cold, dry and tight body that is exacerbated by pretty tough asthma and food allergies – I just don’t bend easily as a result of what I eat or don’t eat. This has required a gradual acceptance that despite starting yoga 16 years ago in earnest commitment, I will probably never be an advanced asana practitioner. The Primary Series was hard-won with lots of encouragement from Kathryn (also a mum) and Sarah, who watched me do the usual thing of running a full-time job and lots of other commitments along the way. Once so hard-won, how would I ever feel about giving up the level of flexibility I had gained, or the commitment to my practice, or the temporary pause in teaching after working so hard to qualify and learn? All of this was bubbling away under the surface as these things do. What I had gradually learned of course was that asana was only part of the picture, and I had only truly taken that on board mentally in the last five years, despite claiming to understand this previously. And only in the true letting go and relinquishing control had I become pregnant. So starts the real lesson! I talked to P atricia, a new mum who also practises at BNHC, as I had heard about this book and she confirmed it was important to read. I was aware of Anna Wise, having lived in London for many years and having attended two of Sharath’s workshops at the Camden Centre (organised by Hamish Hendry) but have never met her personally. I also recognised some of the names in the book – as all of us do when reading around the topic of yoga. But what a stunning book to open and read through – I devoured it in huge chunks, sometimes en route to work but often in the middle of the night when the baby was kicking and it seemed like the whole world slept on peacefully. 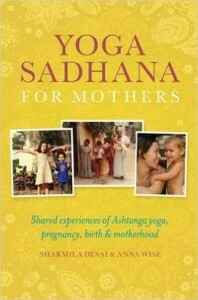 The book contains personal stories from women practising Astanga yoga, through the challenge of conceiving (or in some cases, being unable to conceive), pregnancy, birth and recovery. Anecdotes range hugely and there is a clear explanation at the front to reassure the reader that not one story is “right”; there is no judgement here. It has been reassuring to read that many of the women also felt real angst about the change to their life and the implications for their practice (in all senses) and a confirmation that of course, nothing comes easy! In all stories however is the same thread of the Astanga practice, in whatever that means for an individual, as a guiding light through the challenges ahead. It also confirmed to me the real sense of the Astanga community providing love and support -something that I feel is really true of Yoga Base Brighton at BNHC. I’ll certainly need to lean on that shortly when I’ve had 30 minutes sleep a night for days on end! The book also goes through the asanas and modifications, alongside advice about diet and general nurturing of your body as it expands and contracts throughout the process. Even touching the floor now requires me to turn my feet out slightly and bend my knees heavily, which both amuses me and makes me feel like a toddler! So there’s a real sense of acceptance: This is me, my body is growing and changing towards labour and I’m pretty fascinated by what it is able to do despite the ongoing asthma and allergies – I just need to trust in myself and ensure I rest and take care of this other person who is preparing to come into the world soon. I appreciate this review is as much about my experience as about the details of this book but it feels apt considering it’s just another story. Thank you to everyone at BNHC who has kindly asked me how things are going and given me a little extra space as I move more slowly around my mat. Looking forward to introducing a new person to you all soon.